This document helps you to install Disco from source, either on a single server or a cluster of servers. This requires installation of some Prerequisites. Disco users start Disco jobs in Python scripts. Jobs requests are sent over HTTP to the master. Master is an Erlang process that receives requests over HTTP. Master launches slaves on each node over SSH. Slaves run Disco tasks in worker processes. You need at least one Linux/Unix server. Any distribution should work (including Mac OS X). The same version of Erlang and Python should be installed on all servers. The default version of Python on the clients from which Disco jobs are submitted should also match that on the servers. Due to issues with unicode in Python2’s httplib library, we recommend installing the pycurl package. Disco will transparently use pycurl when available. cd lib && python setup.py install --user && cd ..
Its convenient to add the disco command to your path. Download a recent version of Disco. Extract the package (if necessary) and cd into it. We will refer to this directory as DISCO_HOME. This is often the easiest and the least intrusive way to get started with Disco. Or you can install these libraries in your favorite place. Disco must be located at the same path on all the nodes. If you don’t see any Disco processes, you may want to try Troubleshooting Disco installation. Next we need to enable passwordless login via ssh to all servers in the Disco cluster. If you have only one machine, you need to enable passwordless login to localhost for the Disco user. Now try to login to all servers in the cluster or localhost, if you have only one machine. You should not need to give a password nor answer to any questions after the first login attempt. Repeat the command for all the servers nodeX. The Erlang cookie must be readable only to the disco user. If it isn’t, run chmod 400 ~/.erlang.cookie on all the nodes. At this point you should have Disco up and running. The final step, before testing the system, is to specify which servers are available for Disco. This is done via Disco’s web interface. Point your browser at http://<DISCO_MASTER_HOST>:<DISCO_PORT>, where DISCO_MASTER_HOST and DISCO_PORT should be replaced with their actual values. Normally you can use http://localhost:8989, if you run Disco locally or through an SSH tunnel. You should see the Disco main screen (see a screenshot). Click configure on the right side of the page. 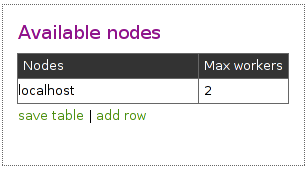 On the configuration page, click add row to add a new set of available nodes. Click the cells on the new empty row, and add hostname of an available server (or a range of hostnames) in the left cell, and the number of available cores (CPUs) on that server in the right cell. Once you have entered a value, click the cell again to save it. Keep in mind that for more than one node, hostnames need to resolve globally (e.g. you should be relying on DNS to resolve hostnames, not /etc/hosts on an individual machine). Hostnames used by Disco are shortnames, and not fully qualified hostnames. DNS must be configured to correctly resolve the shortnames of the hostnames in the cluster. Disco cannot currently use raw IP addresses for hostnames. Short DNS hostnames must be used to name cluster nodes. A relatively common mistake is that master is just an alias for the loopback address, such as localhost, provided in /etc/hosts on the master machine. In such cases, some nodes may not be able to resolve the master properly: they may all resolve to themselves (if they all have the same hosts file), nothing at all, or different machines (if they are configured differently). You can add as many rows as needed to fully specify your cluster, which may have varying number of cores on different nodes. Click save table when you are done. It is not advised to use the master as a slave node in a serious Disco cluster. This table specifies that there are 30 nodes available in the cluster, from nx01 to nx30 and each node has 8 cores. Now Disco should be ready for use. We can use the following simple Disco script that computes word frequencies in a text file to see that the system works correctly. Disco attempts to use the current hostname as DISCO_MASTER_HOST, if it is not defined in any settings file. If you are runing Disco on multiple machines you must use the same version of Python for running Disco scripts as you use on the server side. You can run the script on any machine that can access the master. The safest bet is to test the script on the master node itself. If the machine where you run the script can access the master node but not other nodes in the cluster, you need to set DISCO_PROXY. The proxy address should be the same as the master’s above. This makes Disco fetch results through the master node, instead of connecting to the nodes directly. If the script produces some results, congratulations, you have a working Disco setup! If you are new to Disco, you might want to read the Tutorial next. If the script fails, see the section about Troubleshooting Disco installation.